Outstanding wildlife diversity, sky touching buildings, powdery white beaches and lush mountains make South Africa just the right choice for the action-packed trip. Explore the fascinating attractions of South Africa like Johannesburg, Cape Town and Garden Route on this holiday. Your fun-filled vacation would begin as you arrive at Johannesburg. The vibrant heart of South Africa, Johannesburg is a buzzing city that is mainly dominated by an exquisite palette of colonial architectures and skyscrapers. From Johannesburg Airport, get transferred to your place of stay on a shared basis in a coach/bus (seat-in-coach i.e. SIC basis). Check-in at the hotel (standard check-in time is 2 PM) and spend the rest of the day at leisure. Since Johannesburg is the fashion capital of South Africa then why not spend your day in some retail therapy (suggested activity at your own expense). It is suggested to explore Sandton City, one of the best malls in the city lined up with brands like TopShop, Zara, and Mango and so on. While filling your shopping bags, you could also stop at tuck shops and pick some snacks. As the day comes to an end, enjoy your dinner and retire to the comfortable hotel room for a relaxing overnight stay. Post breakfast, head out for an Oudtshoorn Tour. Start your tour with an excursion to Cango Caves*, one of South Africa’s greatest natural wonders. As you enter, admire mysterious and strangely beautiful fascinating rock formations, cellar-like chambers and low passageways. Squeeze your way through narrow passages to see famous attractions like Cleopatra’s Needle, the Leaning Tower of Pisa, etc. Up next, head to Cango Wildlife Ranch where you could see the world’s most endangered species. Thereafter, explore Safari Ostrich Farm, where you could see these amazing birds growing, from egg to adulthood. Before exiting the farm, do explore the unique souvenir shop. After spending an exciting day, enjoy your dinner and retire to the comfort of your hotel for a relaxing overnight stay. Note: For visit to Cango Caves, comfortable footwear is recommended. Post breakfast at the hotel in Mossel bay, check-out (standard check-out time is 11 am) and get transferred in a shared bus/coach to the next destination of your trip - Cape Town. Known as the Mother City, Cape Town features everything, from buzzing nightlife to picturesque beaches and natural surroundings bustling with flora and fauna. Once you reach Cape Town, get transferred to your place of stay in a coach/bus (seat-in-coach i.e. SIC basis). Check-in at the hotel (standard check-in time is 2 PM) and get ready for an exciting evening at V&A Waterfront, Cape Town’s premier shopping and entertainment hub. Take a stroll around and get bewitched by its old world charm as you see the famous historical landmarks. Enjoy your dinner and relax in the comfortable hotel room. After breakfast, head for a Table Mountain Tour* in a cable car (subject to weather condition). While enjoying the ride, you could see lush mountains sprinkled with beautiful wildflowers. Once you reach the peak, lay your eyes on sprawling views of the gorgeous coast and the surrounding area. After taking in the view, reach Cape Town for a Half-day Orientation Tour. During the excursion, visit the Castle of Good Hope, a 100-year-old city hall that is known for its mock-Baroque architecture. You would also visit the Company's Garden, known for its grassy lawns and statues of notable figures. Make a point to see approximately 350-year-old Pear Trees, South Africa’s oldest cultivation. Learn about Muslim heritage as you explore the colourful Malay Quarter. 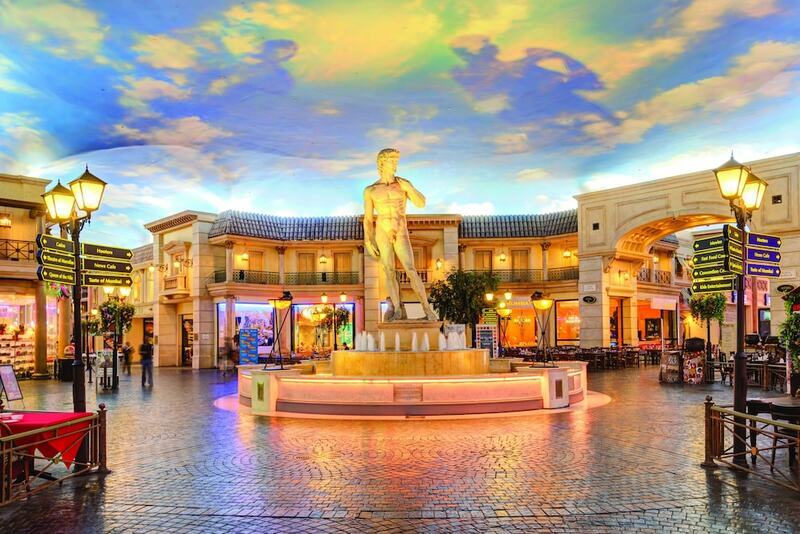 End the day by exploring Canal Walk Shopping Centre as you desire. After exploring the famous attractions of Cape Town, head back to the hotel for a relaxing overnight stay after a delicious dinner. Start your day with breakfast and embark on a full-day tour around the Cape Peninsula. While travelling through the spectacular attractions, you could see penguins and admire exotic flora. Explore the Seal Island (weather permitting) and marvel at the array of birds. Get dazzled by the sweeping coast and mountain views, and then head for a drive to Chapman’s Peak (if open). It is also a great place to admire the fauna and flora of the Cape Peninsula. Up next, head to Cape Point. Once there, ride the funicular and reach a lookout point to see exceptional panoramas. There’s also a Lighthouse, which was once used to guide ships around the cape. Do take your camera to capture images of fynbos, wildflowers and rolling green hills. Reach Boulders Beach and explore African penguin colony. Enjoy swimming or stroll around the beaches and keep your eye out for whales, seals and dolphins. In the evening, enjoy your dinner and relax in the comfortable hotel room. Post breakfast, check-out from the hotel (standard check-out time is 11 AM) and make your way to the Cape Town Airport to board a flight for your onward journey. Check-out from the hotel in Mossel Bay (standard check-out time is 10 AM) and make your way to Garden Route Game Lodge - a 3 star resort known for luxury accommodation, open safari game drives and memorable dining experience. Later in afternoon - proceed for Game Drive. The Garden Route Game Lodge is home to lion, white rhino , giraffe, elephant, buffalo , cheetah and an abundance of antelope and smaller mammal species. You will also experience the close up sightings of the Wild life, exquisite sun downers before returning back to the hotel. Dinner will be served in the resort itself. Post breakfast at the hotel in Garden Route Game Lodge, Check-out (standard check-out time is 10 am) and head out for early morning game drive - a unique experience to witness the wild life and later get transferred in a shared bus/coach to the next destination of your trip - Cape Town. Known as the Mother City, Cape Town features everything, from buzzing nightlife to picturesque beaches and natural surroundings bustling with flora and fauna. Once you reach Cape Town, get transferred to your place of stay in a coach/bus (seat-in-coach i.e. SIC basis). Check-in at the hotel (standard check-in time is 2 PM) and get ready for an exciting evening at V&A Waterfront, Cape Town’s premier shopping and entertainment hub. Take a stroll around and get bewitched by its old world charm as you see the famous historical landmarks. Enjoy your dinner and relax in the comfortable hotel room. After breakfast, head for a Table Mountain Tour* in a cable car (subject to weather condition). While enjoying the ride, you could see lush mountains sprinkled with beautiful wildflowers. Once you reach the peak, lay your eyes on sprawling views of the gorgeous coast and the surrounding area. After taking in the view, reach Cape Town for a Half-day Orientation Tour. During the excursion, visit the Castle of Good Hope, a 100-year-old city hall that is known for its mock-Baroque architecture. You would also visit the Company's Garden, known for its grassy lawns and statues of notable figures. Make a point to see approximately 350-year-old Pear Trees, South Africa’s oldest cultivation. Learn about Muslim heritage as you explore the colourful Malay Quarter. End the day by exploring Canal Walk Shopping Centre as you desire. After exploring the famous attractions of Cape Town, head back to the hotel for a relaxing overnight stay. Start your day with a delicious breakfast and head out to your journey back to Johannesburg. After spending an exciting day, enjoy your dinner and retire to the comfort of your hotel for a relaxing overnight stay. Post breakfast, check-out from the hotel (standard check-out time is 11 AM) and make your way to the Cape Town Airport to board a flight for your onward journey with the group. Check-out from the hotel after breakfast and proceed to Cape town Airport to board the overnight flight to Kenya. Arrive at Nairobi Airport and take a six hour drive through the Rift Valley Escarpment to reach the world famous Masai Mara National Reserve. A huge expanse of gently rolling grasslands, specked with flat-topped acacia trees, Maasai Mara is undoubtedly the world’s prime game viewing area. As you reach the accommodation in the reserve, relax in the comfortable tent. Embark on a Game Drive after lunch and begin to discover the reserve's natural treasures. Observe the majestic African elephants as they gather around the dry bushland. See lions with their cubs enjoying their meals and cheetahs streaking across the plains. Cross the Mara River and see gigantic crocodiles playing hide and seek with their prey and hippos wallowing in the water. Do maintain silence during the safari as you might be disturbing a mother lion relishing her treat. In the evening, enjoy dinner and a comfortable overnight stay at the camp. Wake up to fresh air in the morning and get ready see unhindered views of the wilderness as you stroll around the tent. Spend your day today on morning and afternoon Game Drives to observe the magnificent animals in their habitat in a safari minibus. Look out for cheetahs, leopards, spotted hyenas, black-backed jackals, bat-eared foxes, caracals and lions. Wildebeest, zebras, impalas, elands, reedbucks, waterbucks, black rhinos and elephants are also some of the species that call Maasai Mara home. In between, take a break for packed lunch and then continue your quest to experience the density of wildlife that flourished all across Africa just a century ago. Perfectly suiting its reputation of being an animal kingdom, the park is also home to a good variety of birds as well. Click pictures of the colourful kingfishers eating fish or ferocious looking monitor lizards crawling on trees in search of prey. As the day passes by and intensity of sun rays starts reducing, the real beauty of the park emerges and it looks magnificent. After getting up-close with the untamed world of wildlife, head back to the camp for dinner. Have a comfortable overnight stay at the camp. After breakfast at the camp, embark on a four-hour drive in a comfortable shared coach/bus to reach Lake Naivasha. As you leave the park, you might get your last glimpses of the great African beasts. Surrounded by grassy banks and cacti and sand olive trees, Lake Naivasha is the Rift Valley's highest lake (at 1884m above sea level). While boating on this lovely beautiful lake, you could see giraffes and zebras relaxing on the bank. Do carry your binoculars to see vibrant flamingos adding exotic colours to the striking landscape. On your arrival at the lodge by afternoon, enjoy your lunch and spend the rest of the day at leisure and get ready for an exciting Boat Ride. You could relax and curl up with a good book in the comfortable room. Else, make most of the facilities available at the lodge (cost as applicable). Enjoy dinner and rest in the comfortable room. After having a wonderful encounter with wilderness, it’s time to pack your bags and head back home today. Check-out from the lodge and head to the Jomo Kenyatta International Airport in Nairobi, which is 136 kilometres away, to board a flight for your onward journey. It is time to bid adieu to Kenya and head back home, armed with an enriching experience and memories to last a lifetime. Cape Town is famous for its vibrant culture, exotic beaches and colonial architecture. There are so many interesting things to do in Cape Town that tourists can never get bored of this amazing city. With a never ending list of tourist attractions here, sightseeing is one of the most important things to do in Cape Town. Travellers should definitely explore the spectacular beaches in and around the city, primary among them being Clifton, Camps Bay, Gordon's Bay and the Bikini Beach. Some other worth visiting places in the city includes the Bo Kapp neighbourhood, the Castle of Good Hope, the Table Mountain, the Kirstenbosch National Botanical Gardens, Cape Point and the Robben Island. One of the important things to do in Cape Town would be to indulge n shopping. Visitors can shop till they drop' at bustling markets and malls of the city. Places where visitors would love to go on a buying spree include Victoria & Alfred Waterfront, the Cavendish Square Shopping Centre, the Somerset Mall, the Montebello Craft and Design Centre, the Willowbridge Shopping Centre and the Church Street. Cape Town is a perfect for adventure freaks. The city has great opportunities for swimming, surfing, yachting, mountain biking, sand-boarding, kite surfing, deep sea fishing, scuba-diving, kayaking, paragliding and skydiving. In addition to these, travellers look for some real thrill can opt to go for shark cage diving to see the amazing white shark in its natural habitat. Tourists interested in hiking can visit the Cape of Good Hope Trail, the Hoerikwaggo Table Mountain Trail and the Orangekloof Hiking Trail. Some other great activities that travellers can do here is to go for a wildlife safari tours and helicopter tours of the city. Information about Things to do in Cape Town like Shopping, Nightlife in Cape Town, Activities in Cape Town. Traveller reviews and photos, feedback for Cape Town attractions. Thanks a lot for such a great support .